Aspire Down Under offers travelers unique experiences in each location. Our philosophy is to engage visitors in the culture of Australia, and allow them to see the country through the eyes of a local. Escape the humdrum routine of work and ignite your senses. You will visit 2 amazing Australian destinations and uncover a vacation that reminds you how invigorating it is to go off and explore the globe. Indulge in this 4-star customized vacation package that takes you into some of the magnificent highlights of Australia! Upon arrival into Cairns, journey an hour north to Port Douglas, the gateway to an amazing selection of touring options encompassing the Reef, the Outback and the Rainforest. Continue onto Sydney, the jewel of the Southen Hemisphere, offering something for everyone: adventure, shopping, theatre, beaches, you name it. You’ll feel like a local by crusing on a well-appointed yacht in the harbour. This package will give you a great highlight of Australian culture, and will certainly leave you with the desire to return. 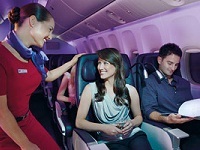 Flights on award winning Virgin Australia down to Sydney then back home again. Our package price includes flights in coach class with options to upgrade to Premium Economy, Business or first class – you choose! Our exclusive offer - Stay for 4 nights and pay for 3 nights! This morning you will be transferred by seat in coach shuttle to Cairns airport. Fly Cairns to Sydney. On arrival in Sydney you will be met and transferred by seat in coach shuttle from Sydney airport to the Radisson Blu Plaza Hotel Sydney. Special Value Add – Stay for 4 nights and pay for 3 nights! Add-on fares are available from other cities. Seats are limited and may not be available on every flight. Hotels are subject to availability. All prices reflect a 3% discount for purchases made by cash/wire transfer/check, please see terms and conditions for credit card payment. There are no discounts for payment made by credit cards. Cancellation penalties and other restrictions apply.